13. Future of sensory panels. 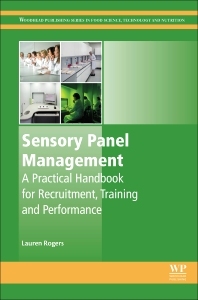 Covering all aspects of sensory panel management, this volume describes the different types of sensory panels (for example panels for quality control, descriptive analysis and discrimination tests), discusses the issues involved with sensory testing, and gives detailed information about sensory panel recruitment, training and on-going management. The book is divided into three main sections. The first section looks at the recruitment of sensory panels, covering the process from both a scientific and a human resources angle. The second section deals with the training of a sensory panel. Initial training, as well as method and product specific training is covered. Example session plans for running panel sessions for quality control, discrimination tests, descriptive profiling, temporal methods and consumer tests are included within the specific chapters. Refresher and advanced training such as training panelists to take part in gas chromatography-olfactometry are also included. The third section examines the performance of sensory panels. Chapters within this section explore performance measures and ways of preventing (and dealing with) difficult situations relating to panellists. A final chapter looks at the future of sensory panels. Throughout the book there are short case study examples demonstrating the practical application of the methods being discussed. Sensory Panel Management is a key reference for academics, technical and sensory staff in food companies. Lauren Rogers is an independent sensory science consultant in the UK with more than twenty years of practical experience. She has worked on a wide variety of projects, including shelf life studies, product and flavor optimization, new flavor development and in-depth brand analyses. She is a member of the Society of Sensory Professionals, the Institute of Food Science and Technology’s Sensory Science Group, the Sensometric Society and is also a member of the ASTM Sensory Evaluation Committee (E18). Lauren Rogers is a freelance sensory science consultant who has over 25 years’ experience in sensory science. She worked for Dalgety Plc/DuPont (a food ingredients company) and then moved to work for GlaxoSmithKline working on beverages and health-care products. Lauren has recruited and trained panellists for work on various foods and drinks, as well as several home and personal care products. Lauren is a Fellow of the Institute of Food Science and Technology (IFST) and an active member of the IFST’s Sensory Science Group, maintaining their Foundation, Intermediate and Advanced sensory science qualifcations. Lauren is also a Registered Sensory Scientist, a member of the Sensometrics Society, the Society of Sensory Professionals and the ASTM E-18 (Sensory) Committee.